It was a terrible performance, and it was the fault of the driver. General Motors today unfurled mileage figures for the upcoming Chevy Volt and, as expected, it's a complicated affair. The Volt largely drives on electricity, but it also sports a gas generator that helps power the car over long distances. On batteries alone, it gets the equivalent of 93 miles per gallon, close to the 99 MPG rating for the Nissan Leaf and way higher than anything else in its class. On gas alone, the car gets 37 miles per gallon. The Volt, however, rarely drives on gas alone. In the end, the EPA gave it a blended rating of 60 MPG. "You have requested torque and so we have to provide electricity to meet that demand," he told me. In the end, the test drive resulted in one of the worst mileage rating the GM representative had ever seen. In fact, the car's economy rating metrics gave me a rating of zero. Again, It wasn't the fault of the car. 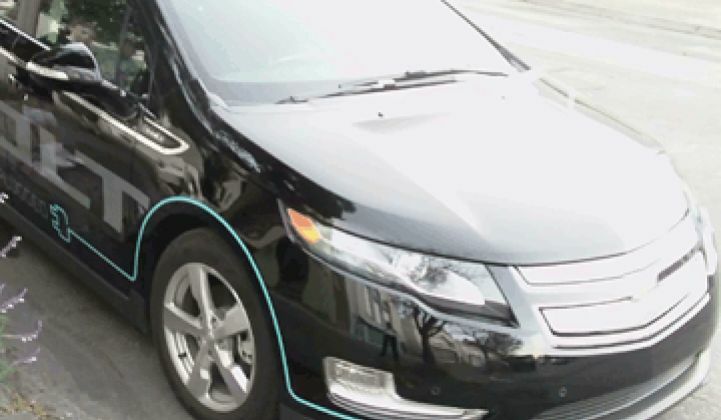 The Volt is fun to drive, it didn't sag on the hills and held four people comfortably. ("This is way better than my dad's PT Cruiser," said one of the ten-year-old passengers.) It was pure operator error. Still, it demonstrates how ranking all-electrics and plug-in hybrids will be challenging. And here's a view of the interior console.